This week, as I celebrate the birthdays of my friends Cris and Liz, I am posting today’s piece in honor of them, and in honor of our friendship. I love you, girls! My friend Liz and I had signed up for the “Gymboree” class together. Gymboree was kind of a “Mommy and Me” class for moms and their babies to meet and play. She and I were fledgling friends back then; our husbands worked with one another and our daughters were born six months apart. When her Caroline was a newborn, already lithe and lean, I would bring Alexandra over to visit and we would sit on the sofa and drink International Delight Coffees and breastfeed our babies while we got to know each other. It’s been nearly twenty years now, and we’ve been talking ever since. We met our friend, Cris, at the same Gymboree class. Her son Billy was a blonde, blue-eyed doll of a boy, the same age as our girls. Cris, a sweet and gentle, maternal spirit, found her identity in being a mom, too. The three of us took our babies all over the ” Mom Circuit” in those early days, which is to say we frequented Chuck E. Cheese, the toddler program at the local library, and a human gerbil-maze called “Owlberts”. We chased our kids through every park in Raleigh, including our favorite one, Pullen Park, which has a real train to ride and the kind of ancient, metal playground equipment that we had played on ourselves as kids. We taught our toddlers how to swim at public pools on sweltering summer days, and met at the mall to feed the kids at the food court on the chilly winter ones. At one-another’s houses, the host-mom would often serve lunch sandwiches cookie-cuttered into stars and hearts, or chicken nuggets shaped like dinosaurs. The kids would play and fight and run and nap together. And we moms were bonding, too. We three just “clicked”. Cris and I were brand-new at this parenting thing, but Liz had a five-year-old son as well, so we looked to her for advice. The three of us were stay-at-home moms with beautiful new babies, and truly – it just doesn’t get any better than that. It was becoming apparent that the three children were individuals; that there was something to the “nature” portion of “nature vs. nurture. As they grew, their personality traits surfaced a bit, showing us a glimpse of who they were born to be. Caroline, the quietes,t was the most driven to succeed at building a Lego tower or stringing the best macaroni necklace. Billy had a competitive streak, and was all about the playing games, and being outdoors. Alexandra was all about the dress-up, creating some of the most interesting outfits, and talking the whole time. She was bossy and extroverted, and strived to be the center of attention. Still, we moms had tons in common. We built relationships with one-another beyond play groups and potty-training. Beyond sharing recipes for homemade play dough, our friendships were about sharing life, albeit with a lot of interruptions. Or with our heads cocked with “Awwwww!” at the cutest things they did; Liz ever-ready with a camera, recording those moments. One summer, Cris invited Liz and I (and our now nearly 2- year- olds) to her mother’s beach house a few hours away. It remains to this day one of my favorite beach trips of all time. Cris had a daughter now, too, and she was only a few months old. We swam with the kids in the pool and sang Raffi songs, played in the waves, and while the toddlers were getting drowsy watching Barney VHS tapes (ad nauseum) and napping, we ate chips with Cris’s homemade salsa and had glasses of chardonnay and talked without much interruption. We- this Band of Mothers – forever linked by the sweet years of our children’s babyhoods, and the saltiness of the ocean. A few months later, we met met one afternoon at the local McDonald’s to let the kids blow off some steam at the new playground. While the cultural phenomenon (and germ receptacle) of the “ball pit” was not new, it was new to us and new to our town. There, I told Liz and Cris the great news that that I was pregnant. Six months later, I had my second daughter, Ashleigh. And what couldn’t possibly get any better, got so much better. And deep inside, I think we knew this, and feared it – that these were the best parenting years; the easiest ones. We felt like we knew what we were doing to some degree, and we suspected that it would not always be the case. Shortly afterwards, some major life-changes happened in quick succession. The children, who had gone to preschool together for years, started different Kindergartens and I homeschooled Alexandra for school. Soon after that, me, my girls and their father moved a few hours away from Raleigh, to the beach. Goodbyes were hard, but we kept in touch for awhile. Christmas cards each year told a little about our friends in Raleigh. Photos of grade-schoolers missing front teeth, shots of Billy in his Football jersey, Caroline in dance recitals. And later, in the awkward adolescent years, reluctant siblings posed together in family photos near the Christmas tree, faces sprinkled with a little acne. The next year, new hairstyles and more genuine smiles. Eventually, they morphed into the young adults that we didn’t realize they would be. Strangers with the inclinations of our babies, but so different from who they were nearly two decades ago. Christmas card snapshots tell you so precious little. It would be over ten years before the three of us and our children would reconnect, gathering once again at the beach for a reunion. There was awkwardness among the kids, for the simple reason that they were virtually strangers. They scarcely remembered spending their earliest days at the park together, finger-painting pictures in preschool for each other. But we remember it. We, this Band of Mothers, now in our mid to late 40’s, we remember it all. We remember when the biggest issue our child could face on a given day might be sitting in the “time-out” chair for refusing to share. We remember agonizing over choosing the right chewable vitamin, and getting the little ones signed up for the best Vacation Bible School each summer. We remember laughing at the antics of our beloved babies in what would indeed turn out to be the best and easiest parenting years. And sharing our innermost thoughts about motherhood with each other without fearing judgment, the truest measure of a good friend. Since those easy days, each of us has been thrown he inevitible curve-ball or two. I am divorced from my daughters’ father, and I’ve also been sober for 11 years from the alcoholism that nearly killed me – the alcoholism that I hid from my dearest friends across the miles because of shame. Each of us has lost loved ones during the many years we were apart; there were medical issues that presented themselves in each of our lives to be dealt with. The Dancer; Caroline….still the quietest, lithe, lean, driven and successful. The Handsome Jock; Billy…still a blonde, blue-eyed doll– in a rugged, manly way, of course. And Alexandra, the Free Spirit…still the chatty, opinionated spitfire she ever was. They grew and challenged boundaries, and found low-grade trouble to get into, and learned the consequences. They made good choices and and soared, made poor choices and gave us all gray hair. One of them got a tattoo (mine, of course) and one of them got into an excellent out-of-state university (Billy), and one has also gone to university and found so much success as a Dancer that I won’t be surprised if she becomes a Rock-ette in New York City. But I think the biggest change in nearly 20 years of friendship for the three of us is this: Our faith has gone from being a minimally-important in our lives, to an absolute necessity on a daily basis where our kids are concerned. Whereas we would think to pray bedtime prayers with them when they were small, each of us Mothers has a deep, abiding trust in Jesus Christ and we cover our kids with prayer continually. We were right back in the day: we wouldn’t always know what we were doing as parents. And this deepened faith has also deepened our bond to one-another, Liz, Cris and I. We are A Band of Mothers not just for a season. We supported each other through the play date years, and enjoyed one-another’s company. We thought we knew our children intrinsically, and helped each other out with advice. 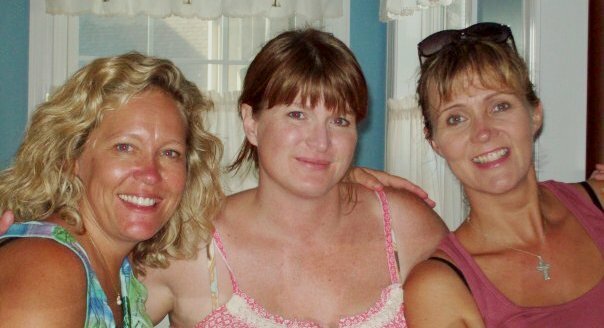 But now, I see the three of us for who we really are: A Band of Mothers sharing a friendship for a lifetime, supporting each other through the really difficult times (should Caroline move to NYC to dance? Billy wants to go out of state to University! Good Lord, Alexandra finally went and got her nose pierced), through marriage crisis, through health scares, and diagnoses, and through crises of our very identities as Moms. Who are you, really, once the kids are out of the nest. Who are we now? We are meeting at the beach again this year, to enjoy one-another as who we are now, all these many years later. Because we are not just a Band of Mothers, but a band of Sisters in Christ, and friends on a level that many do not understand. On a level that I, myself, don’t even understand. We will talk – uninterrupted now – about sharing new recipes, about sharing life. We will still wonder “What is normal?” but perhaps less frantically. Frantic takes energy that we don’t have as much of now, so we try to hand it off to God, having learned that we can’t handle it. Thank you Jana. This is beautiful and oh so true. There is no better gift than that of a true friend and I am honored to call you and Liz true friends! Thanks for the trip down memory lane! Can’t wait to see you and taste the salt! I can’t wait, either! You are most welcome – I love you. I KNEW IT. I’d be blathering in tears of JOY before my birthday ended. OH, this is my absolute article by far, and getting printed and framed to accompany the pictures of the days we so loved!! Yes….time marches on; we knew it would. And now as we start these new chapters in our lives , we get to take the plunge and answer that scary question “Who are we now” individually and together. And as I wrap this up, my six year old just ran in here informing me had to “throw up” which he currently is doing. Sigh! Bliss! The more things change….well? The more they stay the same! LOVE TO YOU BOTH MY SWEET FRIENDS!!!! Thank you Jana….the best gift ever! Love you!! OH my…I just saw the rating! I never saw it before, but all your articles are definitely FIVE STARS. LOVE YOU, LOVE THE GIFT, KEEP GOING!!!!!!!!!! Sooo beautifully said!! What a total blessing to be a Mother and to have other mother-friends to share the journey with!! Jana – you are an amazing woman! Nah – I’m riddled with issues, lol….but blessed indeed. Hugs, my friend! Jana, what a beautiful piece of writing. You three women are very blessed to have each other’s spiritual relationship. What a beautiful piece. You describe perfectly the bond between fledgling mothers. My Band of Mothers consists of 5 other women. We met when our first babies were just a few months old. Three boys and three girls born within 6 weeks of each other; we called ourselves The Gerber Gang. Those “babies” are now sophomores in high school. None of them attends the same school, and we mothers have drifted apart, too, but one of the members of our band saw your post and sent it to the rest of us. Reading it, I was instantly transported back to those Gymboree days and the exhaustion, worry, and sweetness they held. We all survived subsequent siblings for everyone, cross-country moves for 2 of us, losing a parent for 2 of us, a cancer diagnosis for 1 of us (lucky me), and are now wading in the tricky waters of raising teenagers. Thank you for this lovely reminder of our sweet beginnings. You are oh-so-welcome. Thank you for taking the time to read it! I pray you’re health (has or) is improving? I love the term “fledgling mothers” …. makes me think of ourselves as little birds, as well. The Gerber Gang of mama birds. And those baby birds? Ah, they fly from the nest soon enough….too soon, really. Thank you every so much! And we are truly blessed. Life does everything it possibly can to get in the way of our friendship, to no avail. We share too much! Hugs to you today.